have to rewind to lap 115. That is when every car on the lead lap pitted. Mike Stefanik had been leading the 85 laps up to then, but an errant tow truck blocked him getting to his pit and cost him the top spot. On the other hand, Tony Hirschman had a great stop and came out with the lead. It sounded like an obvious script for a great finish. The green flag waved with four laps to go in Friday night’s NASCAR Whelen Modified Tour race at Stafford Motor Speedway (CT). Tony Hirschman was out front with a charging Ted Christopher in his rear view mirror. Jerry Marquis and Chuck Hossfeld were not far behind in third and fifth respectively. If fireworks flew, they would be ready to take advantage of that. Mike Stefanik sat in fourth, with maybe the fastest car. Fans who waited out a 30-minute rain delay looked like they would be rewarded by seeing some crazy racing amongst the 16 cars still on the lead lap. Four laps later, only one of those 16 drivers had been able to make a pass. Jeff Malave passed Chris Pasteryak for 14th. 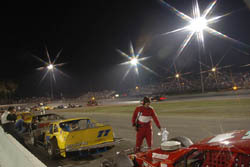 Hirschman stayed in the lead and won. Christopher stayed in second, Marquis stayed in third, and by now you get the picture. The fans did get to see TC do anything in his power to try and win the race. He abandoned trying to get by Hirschman down low and tried the high groove at Stafford. It didn’t work. Christopher’s #13 looked like it was sliding around on snow as he got it sideways while trying to win. “I was overdriving it,” explained Christopher. 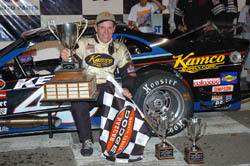 Good enough for Hirschman to take his third victory of the season after sitting through the rain delay. And what of Malave? Remember, he was the driver who benefited most from the race not being called on account of rain. Well, he would have been happy with another 50 laps. 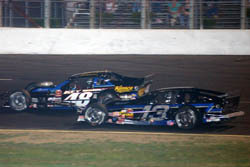 Ted Christopher (#13) just couldn't get by the #48 of Hirschy. “It was a little slippery out there, but you just have to do it,” said Malave. Well, it wasn’t for the lead. It wasn’t even for a top five or top ten spot, but at least the fans that got rained on saw one good battle in the final four laps. The NASCAR Whelen Modified Tour returns to action on Thursday night at Thompson Speedway (CT).